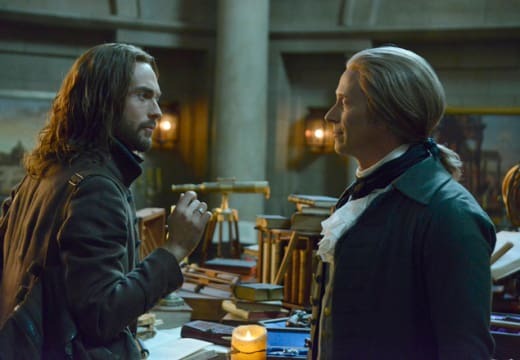 Thomas Jefferson (or rather a hologram version) joined the madness this week on Sleepy Hollow Season 2 Episode 16. The secret crypt Jefferson created for the witnesses housed all kinds of secrets relating to the war against evil. Unfortunately, those pesky reavers were dining on Sleepy Hollow's citizens, leading Ichabod and Abbie to make a tough choice. What did you think of the Reavers, guardians of Jefferson's secret crypt? Jim: I absolutely loathe this trope, it's always the same thing. The heroes find something that will tip the scales in their favor, but they decided to give up (or in this case blow it up) "for the great good". The Reavers had been sealed in there for 200 years, couldn't they lock it down for another day or two and figure out a different way to destroy them? Given Jefferson had them behind bars, Ichabod could have at least grabbed the box Jefferson showed them. BAH! Stacy: Even though the name Reavers makes me immediately think of Firefly, I thought they looked like the Turok Han vampires from season 7 of Buffy. Whitney: They were pretty creepy looking. The shot of them eating the corpse was pretty gross. I have to agree with Jim though, was it really necessary to blow the whole thing up? 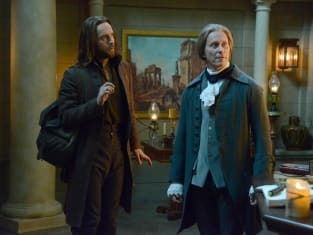 Hank: I agree they were nasty looking, but the entire episode made little sense; even for the world of Sleepy Hollow. I mentioned in my Sleepy Hollow Season 2 Episode 16 review that the show has always been a little campy but the writers pushed it this week. Share your thoughts on the Thomas Jefferson flashbacks and the fact he pushed Crane away for his own good. Jim: I like Jefferson, though I wish they could have delved a little more into why he "unfriended" Ichabod. How did he know he was the witness? Stacy: Jefferson was all right, but I was not really interested in this episode as a whole. Jefferson pushed Crane away to keep him from interfering with the prophecy and just hung around down there waiting for them to find him. I'm with Jim, I was annoyed that they didn't at least grab some stuff on the way out. Whitney: I love me some Steven Weber, so I'll take him any way I can get him. That being said, Jefferson was okay but he wasn't quite as appealing as some of the other historical figures we've met along the way. Because I'm such a fan, I'm glad Steven Weber got more to do than just be in a flashback or two but honestly everything he was involved in was a bit confusing. Hank: While I enjoyed the flashbacks, which felt very Sleepy Hollow, I hated the whole hologram thing. That was ridiculous even for this show. Like Jim said, they should have explained the "unfriending" better. Guess the writers figured that term would be amusing enough for us; not so much guys. You can do better than that. Did you enjoy the fact science/magic kept Jefferson's spirit alive in the Fenestella? Or was it all a bit much. Jim: I would have been ok had they maintained the science rules they introduced. By that I mean, Ichabod was passing his hands through Jefferson, then Jefferson turned around and picked up a book and a large box. Can't have it both ways, either he is a hologram or he is solid. Stacy: I thought it was a bit much. It's kind of the show's "thing" to have Ichabod know every person who was alive during the Revolution, but now they're popping up too? I don't know, I wasn't really feeling it. Whitney: It was a bit much and I was kind of confused which caused me to zone out at times. Hank: Jim hit the nail on the head, that's a perfect example of how poorly written this episode was. That makes zero sense guys, c'mon! It's frustrating because I consider myself a fan of this show, but I can understand why so many people have jumped ship. How do you feel about Irving's ancient rune story and the markings on his arm? Jim: Honestly, it felt like they had to explain how he could be evil and have passed Katrina's test. Given the other old and worn out trope used, I'm not surprised they tossed in the Deus ex Machina trope too. Stacy: It explains how he passed Katrina's test even though his soul is still tainted. I guess he's got a good side and evil side now which I didn't really suspect would be the case. I'm guessing they'll find a way to save him. Whitney: It's nice to know good Irving is still in there, but I have a feeling evil Irving will win out in the end and he's going to have to go for good this time. When he talked about all he's lost, I felt like that was the kiss of death. Hank: It just seemed too convenient to me and a bit lazy, which is disappointing. That reveal should have been unpredictable and different, but it turned out to be another let down. Can you guys tell I wasn't a fan of this installment? I gave it a 2.5 in my review, one of my lowest ratings ever. Was Henry being honest with his mother at the end? Or did the roses thorns seal her fate as part of team dark side? Jim: He was mostly just creepy. I hope that pricking her finger on a rose that was forced into her hands isn't all it take to make her part of the dark side team. Stacy: I think in his own, warped mind he was being honest, but what that means for a guy like Henry is not necessarily what it would mean for a not crazy person. As for the roses, I was thinking that was to prove Henry was really there and she wasn't dreaming. Whitney: I hope it sealed her fate. Katrina joining the dark side would be the best thing to ever happen to her character. Hank: I'm also ready for evil-Kat, she's so damn boring otherwise. I'm kind of over the whole Henry/Katrina (even Abraham) redemption thing. If the writers don't move on from it, they've sealed this series' fate. I was hoping the season would have a strong finish. Then they gave us a Jefferson hologram ugh. Where's Obi-Wan when you need him? Help us, Obi-Wan Kenobi; you're our only hope. It makes me mad just thinking about it. 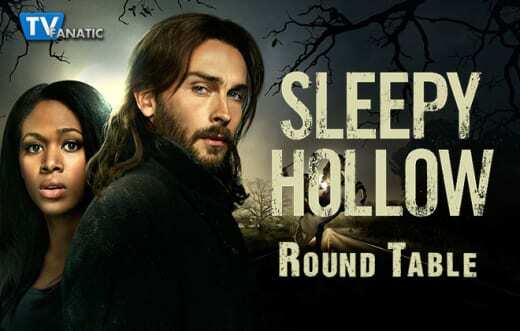 Next week's Sleepy Hollow Season 2 Episode 17 is titled "Awakening" and airs February 16 at 9/8c.